CAOS Conflict Management provides family mediation via London based Mediators offering support for unresolved family conflicts and also Post-Divorce or Separation Mediation for couples. When families experience unresolved conflict the impact can be intense and long lasting. ....... the effects can be stressful and upsetting. 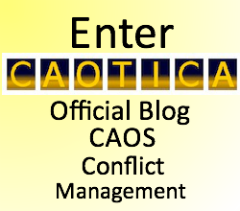 CAOS Conflict Management provides both family conflict mediation and conflict coaching to support family members experiencing such difficulties. Please CONTACT CAOS if you have an enquiry about using Family Mediation or our other services. At CAOS, family mediation supports divorcing or separating couples in managing their situation in a way that acknowledges the difficult feelings and thoughts that can arise in such circumstances. Solicitors and Courts can sometimes seem to think that the only things that need to be sorted out when a couple splits up is who gets the finances, and how much, and when each partner will see their children, if there are any. What is often overlooked is that the difficult feelings and behaviours involved in a relationship breakdown makes agreeing to these things and organising them much more than a simple timetabling or money-sharing exercise. Very strong emotions can arise from a separation that will often affect a partner's willingness and ability to agree to something or even to discuss these things. Click here to find out more, including charges. And if children are involved, organising who they live with, and events in their lives such as which school they attend, when they go on holiday etc. requires a willingness to have some form of workable relationship many years after the separation. Ignoring the difficult feelings involved makes organising these things far harder than if they are able to be acknowledged while organising them. Click here to find out more, including charges, about how CAOS Family Mediation London can help separating or divorcing couples. At CAOS Family Mediation London we are used to supporting people in resolving their disagreements when feelings are running high. We have worked in a wide range of disputes with a full expectation that difficult feelings may have to be acknowledged and addressed before a lasting resolution is to be achieved. And we know that sometimes, one partner may not want to have mediation to try to resolve these issues. That's why we also provide Conflict Coaching. This is 1-to-1 support for anyone experiencing difficulties in a relationship situation to help them manage their own responses in a way that supports them and which supports the best outcome for the difficult situation. Click on this link to find out more about the Conflict Coaching we provide to help individuals experiencing difficulties within a family relationship or after a separation, as well as for other family difficulties. We welcome your thoughts about the contents of this page. Please leave a comment in the box below. Consultancy regarding set-up of Mediation provision within organisations, particularly Universities, and regarding the setting up of independent mediation organisations. Please CONTACT CAOS if you have an enquiry about any of our services. "Tower Hamlets Mediation Service was going through a transformation and we needed an external Mediator/Conflict Coach to assist with communication between staff and Management Committee. Alan was excellent in this role and helped all parties individually first and then as part of a team to work together. He was quite creative in his approach and supported everyone involved through the conflict. Gentle yet powerful."